Morning Prayer will be offered on Tuesday mornings at 8:30 during Advent. The remaining dates are December 4, 11 and 18. This is a brief service, lasting about 15-20 minutes. Participants can use their own Book of Common Prayer or use one from the pew rack at church. Morning Prayer is a wonderful way of starting your day throughout the year. If you have not experienced it before, this might be a good opportunity to do so. If you cannot make it to the service on Tuesday mornings during Advent, you might want to consider doing it on your own. Anyone wanting some guidance on how to incorporate Morning Prayer into your daily spiritual discipline is welcome to get in touch with me and I will be happy to provide some one-on-one instruction. There will be another opportunity for personal spiritual development on Saturday, January 5, 2019, when Rev. Danny Schieffler visits St. John’s to lead a program on Centering Prayer. Fr. Danny is the Rector of St. Mark’s Episcopal Church in Little Rock and has deep roots in Helena-West Helena. This program will take place on Saturday morning between 9 and 12. A continental breakfast will be served. I hope you will participate in this opportunity to learn more about prayer as well as welcoming Fr. Danny on this visit to his hometown. Gluten free Communion wafers are available now. If you desire to receive a gluten free wafer, simply let Fr. Ray know as he distributes the bread at the altar rail. Christmas is less than a month away! The St. John’s Christmas Eve Candlelight Service will be at 6 p.m. Our new organist, Dr. Gabriel Statom will be present, as will a guest soprano soloist. Now is the time to start inviting family and friends to join you in this beautiful celebration of the birth of our Lord. Poinsettia Donations form is at the bottom of the newsletter. Please keep the following in your prayers: Susan Worrell, Debra Richardson, David Henderson, Kathy Sullivan, Larry Bryant, Lynn Jordan, Ray Worley, Carol Jennings, Nancy Howe, Jim Howe, Parker Pace, Heather Treat, Julie Ann Doan, Courtney Turner, Sheila Fraiser, Blake Robertson, P.J. Clay, Rev. Mike Wilkie, Rita Merritt, Kent Shreeve, Jerry Robertson, Mary Hamm, Mary Helen Lagarde, Jo Boone Wild, Richard Hargraves, Gloria Higginbotham, Emma Lee Gordon, Pat Wheeler, Jan Hickey, Paula Oliver, and Kelly Faye Parker. Angels of Grace and Anchor Mission ministries: The items from their wish list this week is laundry detergent & bleach. Dec 5, Wed: There will be no Midweek Eucharist this week. Poinsettia Donations form is above. 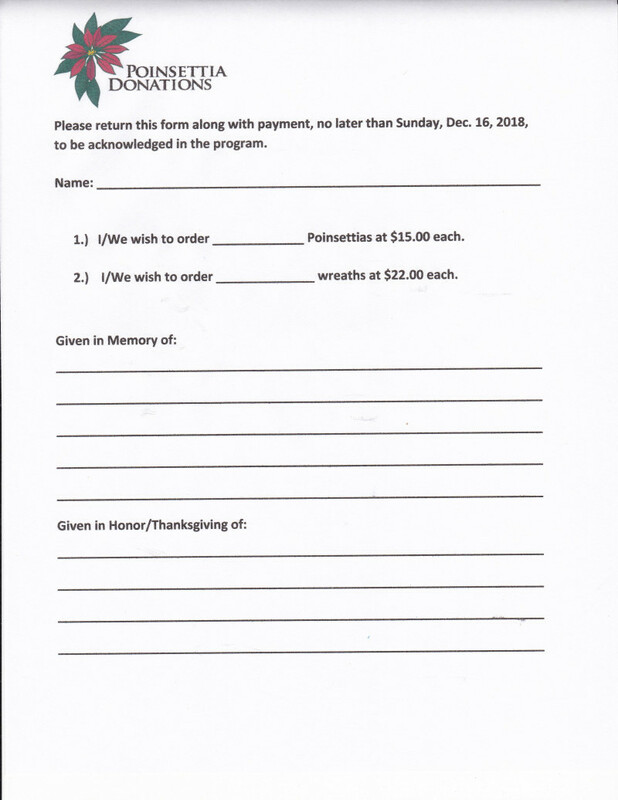 Please turn in to the office by Sunday, December 16, to be acknowledged in the program.